LIVING up to its logo of a rocket, Singapore's newest telco MyRepublic has fired up the competition in the fibre broadband market. In January last year, the company launched an affordable 1Gbps broadband plan - an ultra-fast connection that had rivals playing catch-up. At $49.99 a month, it was cheaper than similar plans from other retailers. It is also shooting to shake up the market by promising unlimited data deals that are currently unavailable. MyRepublic has certainly made an impact since it was set up in 2012. Just two years ago, Singapore was 14th in fixed broadband affordability worldwide. A year after MyRepublic launched its 1Gbps service, however, it shot up to third spot, reveals its Singapore managing director Yap Yong Teck. "This was a huge success and will only serve to benefit the consumers in Singapore with prices coming down in the market," says Mr Yap. MyRepublic has been described as a David versus Goliath story, a small upstart that is taking on the big telco companies. Its three founders - Greg Mittman, Malcolm Rodrigues, and KC Lai - were senior management executives with experience in the telecommunications sector. They left their jobs to pursue an opportunity created by the Nationwide Broadband Network (NBN), a government project to build an ultra high-speed fibre broadband network. As the existing three telcos - Singtel, StarHub, and M1 - were not fully utilising this network, MyRepublic squeezed into a saturated market by offering what consumers wanted: Ultra high-speed Internet connection at reasonable prices. Mr Yap credits the government for the existence of MyRepublic. "Thanks to the Singapore government who pioneered this idea and invested in the NBN as a critical infrastructure development to enable the next phase of growth for Singapore." "MyRepublic's vision is to bring accessible, high-speed Internet connectivity to everyone, bringing innovation to the industry by leveraging on technologies and the creativity of our people. We see great opportunity in fixed mobile convergence especially in advance NBN market such as Singapore." Mr Yap, who has been with the company for less than a year, says the invitation to join MyRepublic was "irresistible". "Many were curious when they heard that I would be joining MyRepublic, moving from an established telco to a start-up and they all asked the same question, 'Why? '," says the former M1 senior executive who has 25 years experience in the industry. For him, MyRepublic presented itself as an "interesting little purple company", daring to be different and was attracted by its simple and powerful marketing messages. Each telco is known for its trademark colour - Singtel is red, StarHub is green, M1 is orange. MyRepublic chose purple. When group CEO Mr Rodrigues, shared with him the vision and plan for the company, he was inspired. "Over a cup of coffee, he then offered me his job in Singapore and challenged me to build a next-generation mobile network as the fourth telco. The opportunity was irresistible," he says. It is perhaps no surprise that he was attracted to the start-up. Way back in 1996, he jumped at the chance to join a new mobile company M1. It was the new entrant into the market that was then monopolised by Singtel. He spent 18 years there, moving across various technical and commercial roles. Today, the 48-year-old is at another emerging telco company, but one that is very different from what he is used to. 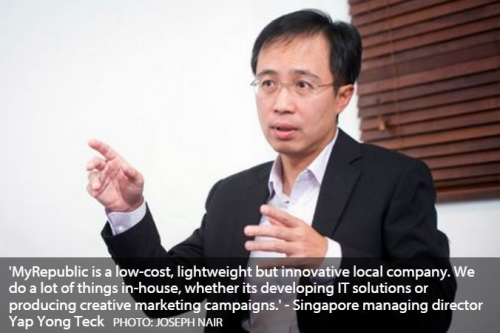 "MyRepublic is a low-cost, lightweight but innovative local company. We do a lot of things in-house, whether its developing IT solutions or producing creative marketing campaigns," he says. The company relies heavily on innovative solutions, such as maintaining their IT infrastructure in cloud services. It also leverages on a strong online sales presence rather than relying on brick-and-mortar shops. Over 50 per cent of its sales come from online channels. "Most importantly, the company isn't afraid to fail, to be different or to challenge the giants in the industry," he points out. Far from failing, it has chalked up many achievements. Apart from being the first to bring 1Gbps fibre broadband services at a mass market price, it was also the first to offer 1Gbps trials to let people experience the difference of gigabit Internet connectivity. The company also caught the eye of Internet investors such as Xavier Niel, founder of Free in France, and Indonesian telco Sunshine Network, owned by conglomerate Sinar Mas. Together, the two investors have pumped in about S$30 million in total. "The ISP started out as an upstart in the industry, but has since caught the attention of the public and analysts alike," he says. So, from around 20 people at the start, the company has grown to 142 staff. Its subscribers now make up 5 per cent of the fixed broadband market. The company has many projects lined up. One major initiative is the mobility trial in the Jurong Lake District which was awarded by the government to incumbent telcos as well as MyRepublic. The trial allows the company to test the next generation mobile solution that aims to provide seamless access across different types of networks. This test will be open to 1,000 public participants in September. The company is also preparing its bid for the upcoming spectrum auction and Singapore's fourth mobile licence towards the end of this year. "If successful, we hope to have a positive impact in the market and bring the benefits to the consumers in Singapore," says Mr Yap, adding that the company has expanded to New Zealand, and is eyeing Australia, Malaysia and Indonesia. But Singapore will remain its base, as the NBN market is much more advanced than many countries in the region. "MyRepublic Singapore will continue to be our innovation hub where new technologies and ideas are implemented and improved before they are replicated in our other markets," he notes. As Singapore celebrates its 50th year of independence, Mr Yap hopes for continued success and that MyRepublic will contribute towards greater development at home and in the region. "At just 50, Singapore's progress has been truly amazing. From a sleepy fishing village, it is now a vibrant cosmopolitan city with a prosperous economy, advanced infrastructures, well-educated workforce, and a unique identity and culture," he says. "Our people are motivated and want the best in life, and I believe that we will only continue to strive for excellence." Indeed, this purple rocket is shooting to be the best on the little red dot.